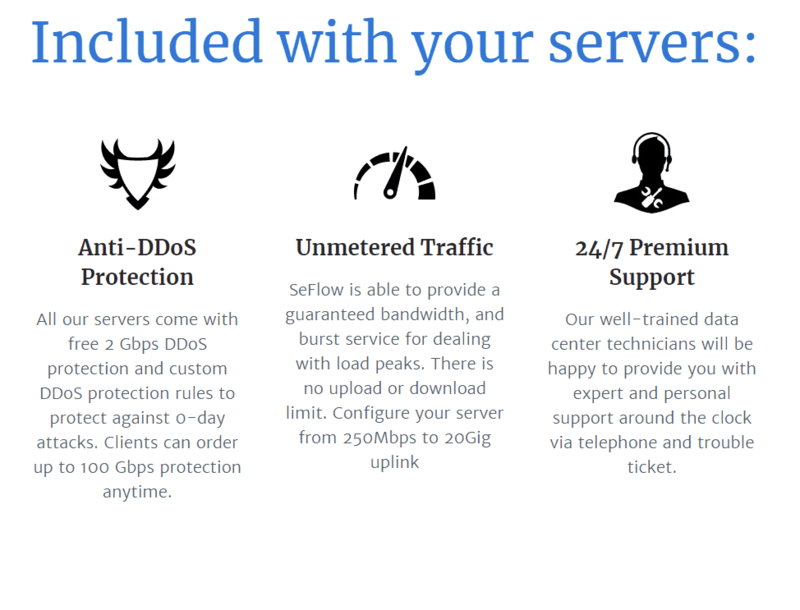 Seflow Review 2019: Is Seflow a Good Hosting? SeFlow is a reliable name in Europe, thanks to their customer base, modern hardware, and skillful staff. They have made partnerships with some of the biggest names in the industry. Working in the web services field since 2004, the main concept that helps SeFlow move forward is offering something different and unique. Its skilled technical staff and partnerships with some of the biggest names in the industry like Juniper and Intel have made it one of the best services providers in Europe. They currently have over 3500 customers, 8000 cloud instances, and more than 9000 dedicated servers. SeFlow offers SSL certificates that guarantee round-the-clock security with military-grade SHA2 as well as ECC 256 bit encryption. This includes features like displaying your company name on the address bar as well as a confirmation of the site being secured. SeFlow supports all kinds of browsers and secures not just your main website but also its subdomains. Their staff will help you install the SSL certificate in case you run into any difficulty during the process. Your servers at SeFlow come with unmetered bandwidth including a ‘burst service’ that is ideal for dealing with events where you expect lots of traffic. You can configure your server from 500 Mbps up to 1Gbps uplink. Furthermore, you can opt for the trademark SeGuard DDoS Mitigation service. They offer 2Gbps basic DDoS protection to which you can easily upgrade later according to your requirements. SeFlow builds its servers in-house with some of the most modern and state of the art hardware available. As for managing all your servers, you can make use of three different types of control panels that include Direct Admin, Parallels and cPanel/WHM. They offer just one dedicated IP as part of your package but you can easily scale up to 29 IPs for an additional price. From their homepage, you can easily view the packages offered for the NVMe Cloud as well as Dedicated Server services. The NVMe Cloud offers 1152MB of memory, 15GB NVMe Disks, and a 3.5+ GHz core. Similarly, the Intel i7 hexacore dedicated server offers 16GB DDR4 memory, 480GB SSD storage, and an Intel i7 8700 hexacore CPU. You can either pay using a credit card or opt for a simple bank transfer. Paypal is also accepted as a valid payment method. The prices are quite affordable. What makes them more attractive though is the fact that you can choose the specifications that you need and configure your custom package and pay accordingly. This ensures you only pay for what you require. SeFlow can easily be contacted by phone or email, or the contact form on their website. You can access the knowledge base section through the Client Portal. It contains articles on most of the topics you’ll need to know about while using their services. Their Twitter and Facebook accounts are updated regularly which is always a good sign and an alternative way of quickly getting in touch with the company. Unfortunately, there is no live chat. To make up for that, they reply to emails 24/7. The best way to start with SeFlow is just to write them about your business and see what solution they come up with. They review and accept requests 24/7 so you won’t have to wait long to get an idea of what they can offer you. Wondering how Seflow stacks up against other Web Hosting companies? Enter any other Web Hosting company and we will give you a side-by-side comparison.